I realize now that timing plays a big part in how one’s neighborhood comes together. For years tiny little Rainbow Road with basically five houses on it (not counting the end of the street houses that have a different road address since they face in another direction) were simply five little houses. When the children were small two of the houses across the street had neighbors whose children played with mine and the neighbors were always so kind to mother, who at that time, lived on the other side. They would keep me abreast of her activities and how she was doing which was a relief to me since I was a single mom then and working full time. Time passed, different people moved in, mother was gone, the children were gone and the five houses went back to just being five house connected by one road…but that was really about the only connection. I kept praying we would get some “new blood” in the neighborhood and lo and behold it came with a young man, Luke, who wanted to buy his first house and was about to be married to Chelsey. But long before that Vickie, my wonderful neighbor next to Luke lived close by… for the longest time we had beeped and waved but that was about that…she was raising her granddaughter and on the go all the time… as well as I was when I worked around the state giving social studies presentations. I was always in and out. But time has a way of slowing down life… Crystal (Vickie’s granddaughter) left for college, all my children were out of the house and we discovered we each had secret gardens in the back of our houses… so we started sharing plants and information about new ones on the market. Suddenly Luke, Chelsey, Vickie and I became close…Vickie watches the “children’s” (as we call them) chickens for them while they are gone and we share desserts and food regularly across the street now. Our neighborhood has turned into a Mr. Rogers’ neighborhood. We watch out for each other houses (and cars) and Luke has added security lights to cover our section of the street. Rainbow Road is now one of the merriest streets in town. Saturday night I woke up with stomach cramps and by Sunday morning I felt like someone had siphoned all the life out of me…I have never felt so weak…could hardly get up and move around. What in the world I thought…must be some kind of stomach bug. Then I fell asleep and slept on and off all day and night. I was supposed to get my blood work checked yesterday but called and cancelled…there was no way I had enough energy to get there and I can only imagine the results of any blood test. 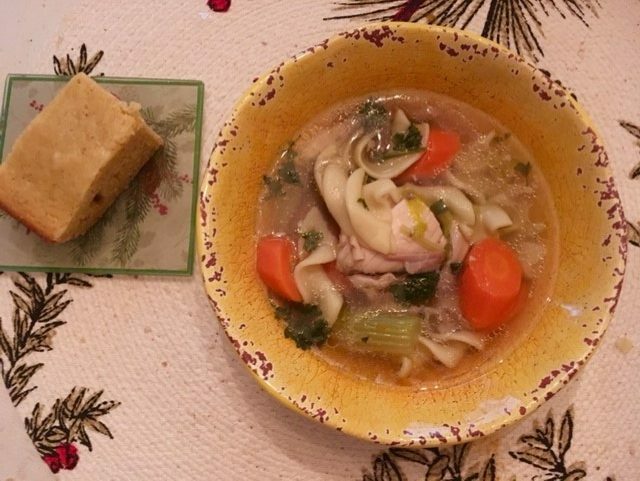 Vickie called to check on me and yesterday afternoon here came homemade chicken soup and cornbread…she had already brought over banana nut bread a couple of days earlier. Unbelievable. 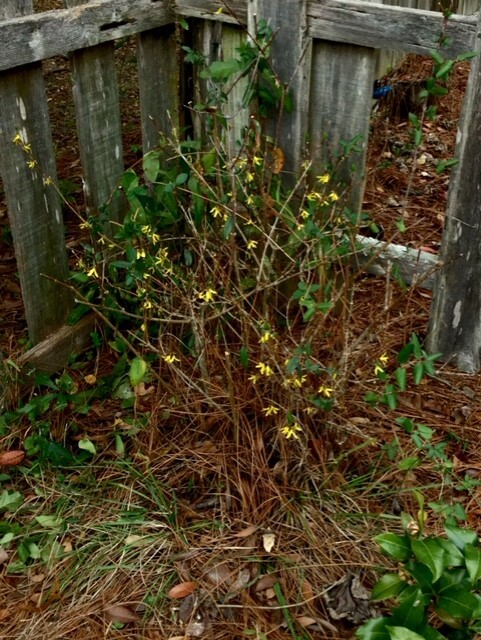 *Here comes my forsythia…the precursor to spring….much better indicator of spring than Phil the groundhog…sorry about that Phil! Though I do hope you are right this year. I really do like Grandma Wilsons quote. May I use it …somewhere. Please do…it’s the neighborly thing to do!